Hey there, how are you doing? Any time I see this post this scripture comes to mind. Heaven and earth will pass away, but my words will never pass away. The word of God is not affected by external factors. 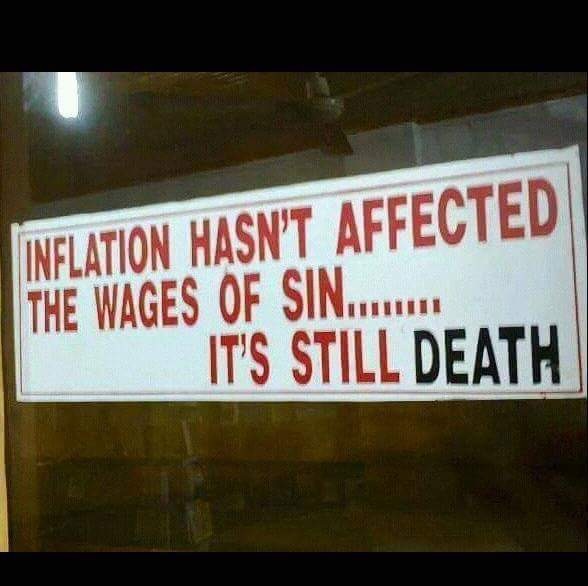 Not inflation, not famine nor any disaster. Even though as ages pass, new developments crop in and human moral standards keep dropping due to what they call “human rights” we still have that Word that does not change. Sometime ago there were certain acts that were frowned upon in certain countries but today they are legally accepted. One thing I want you to take note of is that, the standards of God never changes because He is God! the same yesterday, today and will forever be! Even if inflation affects anything in this world, it goes no where near God’s word for they are not manmade! Incase you’ve forgotten God still rewards them that diligently seek Him against all odds and those who go against Him still suffer the consequences therein. Be wise, be smart, do not go with the world but rather the Word! Because it’s alive and active. Enjoy your day, till we meet again stay blessed. ← There is just One route. How true this is! We cannot continue to give all rights to all people and expect anything more than chaos! One group of people will always be looking to assert their rights over the others. The only answer is to live by God’s standards. His laws are perfect, and even though we are not, His standards turn on peace and love towards all…which works for everyone when we carry them in our hearts!